I’ve been hard at work in Agrarian Skies 2, mostly trying to figure out the different mods and how they work together. I thought that the quest system was good at teaching you the mechanics but it seems now that there’s a whole lot missing from it. Like how I didn’t find out until yesterday that there’s something called a Builder’s Wand that lets you lay down up to 9 blocks at a time and I could have made one a long time ago. Instead I’ve been building giant cobblestone platforms one block at a time and it’s taken me forever. Thankfully, Youtube is forever helpful and I’ve especially come to like the channel Froggy and Phenix. They’ve never done videos about Agrarian Skies 2 specifically, but they do like other skyblock modpacks which often have similar mods and recipes. I’m learning so much from their videos that I started making a list of things I should try to copy in my own game. I’m currently watching their Project Ozone playlist, which is probably the modpack I should have started out with since the quests seem more geared towards players who are new to skyblock worlds. So while it’s probably taken me a lot longer than it should have to get to this point, I’m happy to say that I got my first major automation going, which gathering all the different types of metals. I tried to make the design pretty compact so be prepared for some very cluttered screenshots. 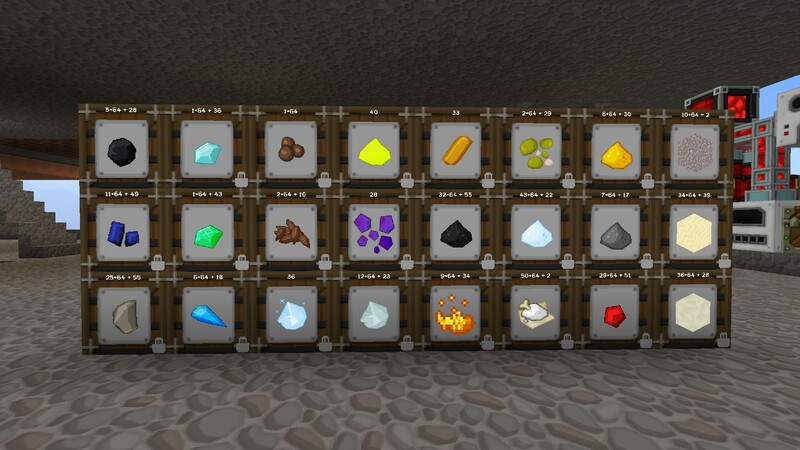 First we have the section for generating cobblestone, lava, and energy. The red arrow points to an Igneous Extruder, of which I have two here. One of its functions is essentially an unlimited cobblestone gen in a single block. After adding a bucket of water and lava each, it’ll create cobble forever with no power or other materials necessary. The cobble is outputted into itemducts (the clear tubes) and is put into one of 10 crucibles (blue arrow). 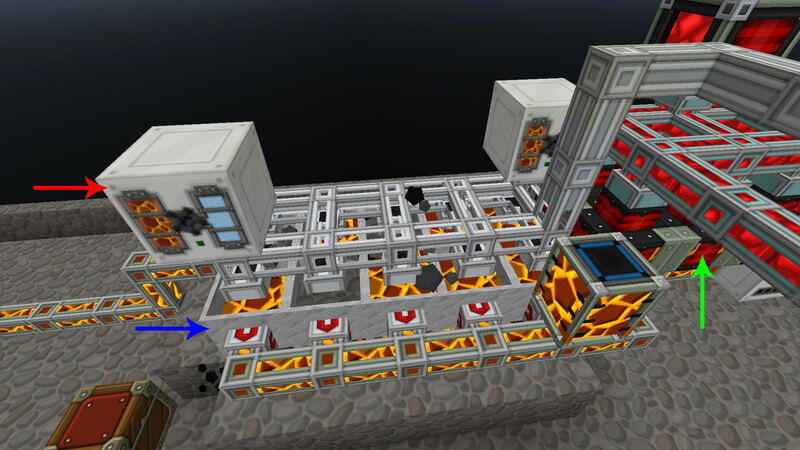 Each crucible is heated underneath by a piece of netherrack lit on fire which eventually turns the cobble into lava. The lava is then outputted through fluiducts (the tubes that appear filled with lava) which goes left to the smelteries (more on that below) and right to 6 Magmatic Dynamos (green arrow). 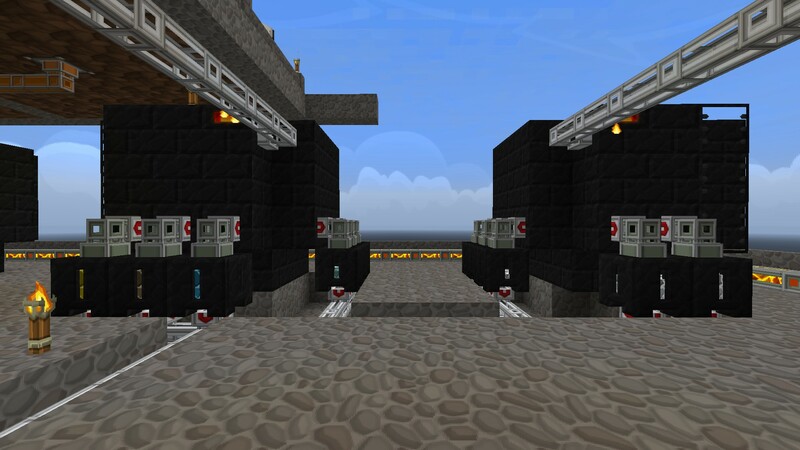 The dynamos are power generators that run off lava and output that power (called Redstone Flux or RF) into fluxducts (the tubes filled with red). They deliver power to a variety of machines including the ones below. 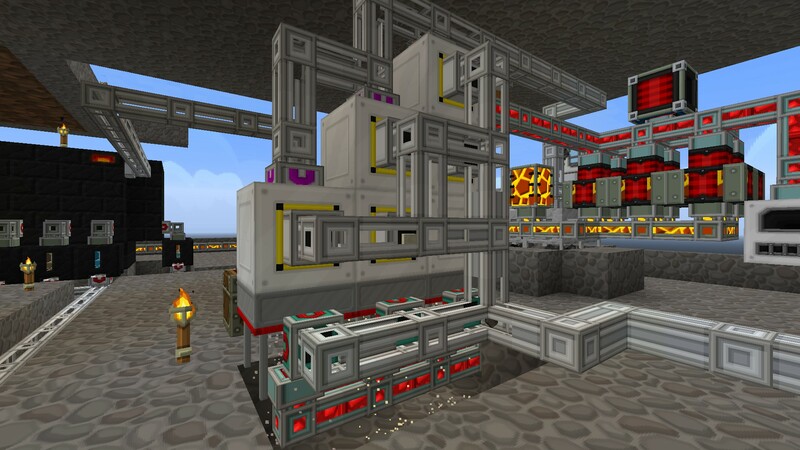 So cobble that is not needed to fill the crucibles is sent over to this other section via itemducts. As I mentioned briefly in my last post, the only thing this whole world contains is my tiny island so mining for metals is a problem. The solution is to sift them from various blocks such as gravel, sand, and dust. Cobble can be hammered/pulverized into gravel, gravel into sand, and sand into dust. 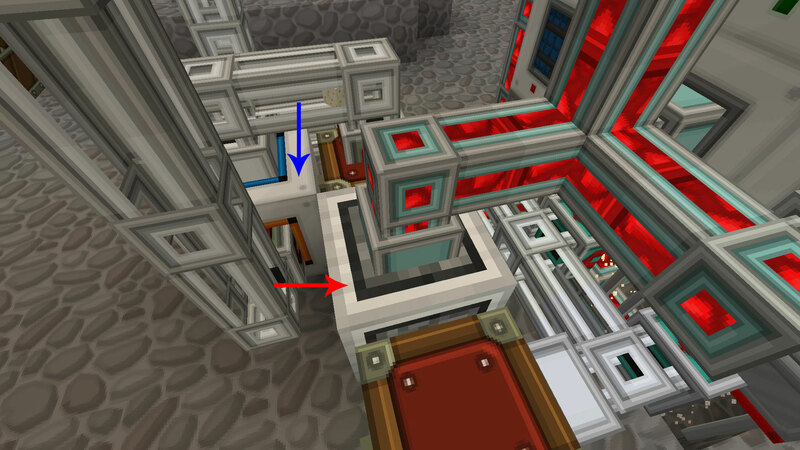 So using a series of pulverizers (blue arrow), I can get these blocks which are then put through automatic sieves (green arrow). There’s three columns here so I can sieve the different kind of blocks. Staring from the left, they are cobble -> gravel -> sand -> dust, cobble -> gravel -> sand, and cobble -> gravel. Gravel, sand, and dust all output the same kinds of metal (just in different forms) but there’s a reason for sifting all three of them (more on that later). The metals are all shuttled into the chest in the lower middle of this screenshot. 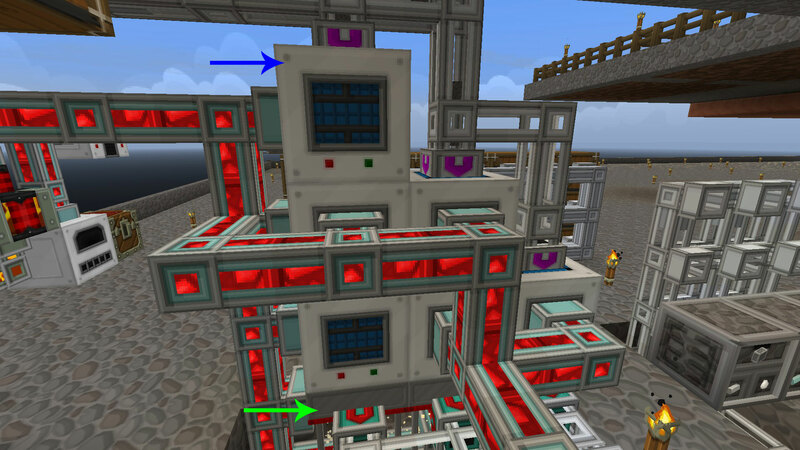 Once there’s four of each kind, the AutoPackager (red arrow) will craft them into ore blocks and output them into the upper chest. I could send them directly to the smelteries right now but pulverizing the ore blocks has the chance of producing some extra ore of another type. So once more they go through a pulverizer (blue arrow) and then itemduct carry the resulting pulverized metal away. Still with me? The most complex parts are now behind us. So the pulverized metals go to one of two smelteries. These are powered by the lava pumped from the crucibles (you can see the lava-filled fluiducts in the background). The one on the right takes iron, silver, tin, and aluminum. The one on the left takes copper, nickel (ferrous), gold, shiny (platinum), and lead. They’re separated like this is prevent alloys from forming. The smeltery melts the melts down and outputs them via fluiducts into casting basins, seen on the front and sides of the smelteries. Once a basin is full of a particular type of metal, it cools into a metal block. The itemducts below the basin them remove the blocks so the basins can be filled again. 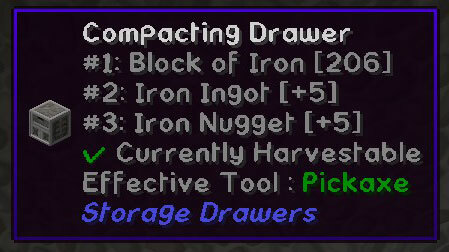 Finally the metal blocks come to their destination, a series of compacting drawers. These drawers are really handy because they can store the blocks, ingots, and nuggets of the same metal all in one container. The left three columns are all the base metals while the right two columns are for the different alloys I’ve been making. I’ll need to expand it as I find new base metals and alloys. I also have a third smeltery that isn’t part of the system (except being fed lava for power) that I use manually for making alloys or casting parts. 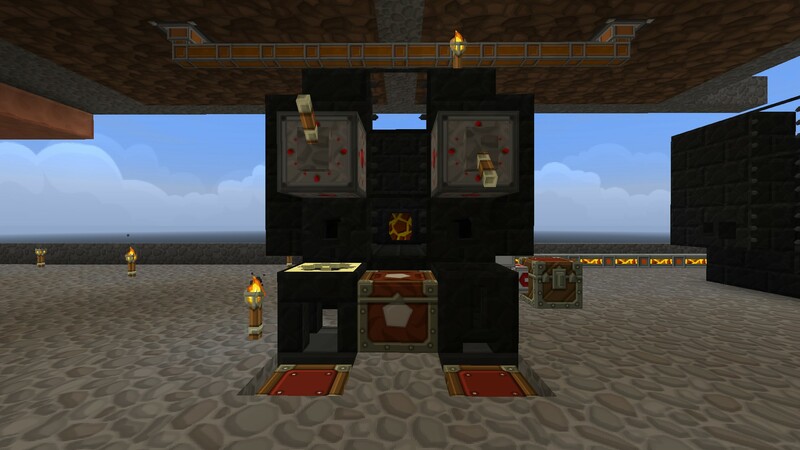 It has two redstone clocks with levers on them, one for a casting basin and the other for a casting table. So I can throw my materials in the smeltery, flip one of the switches, and walk off to do something else while the materials are melted down and put into the basin or table in whatever form I want them. But there’s more! (Of course there is.) Sifting gravel, sand, and dust don’t just give metals but also other handy items. And certain items only come from sifting certain blocks. 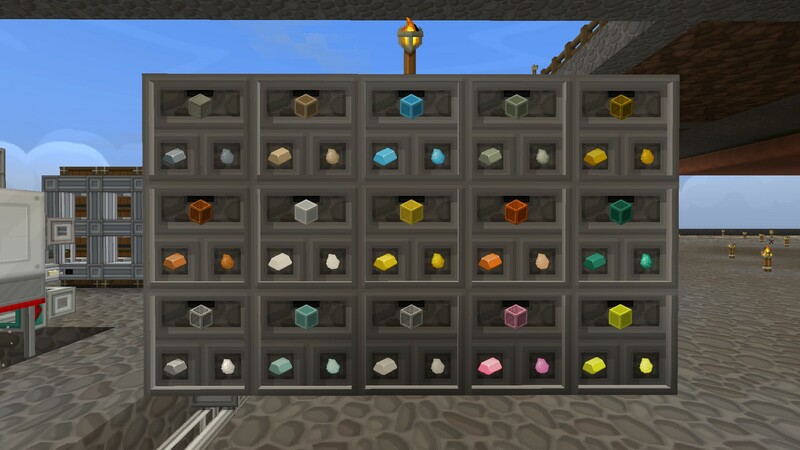 For example, gravel can give you diamonds, emeralds, and lapis lazuli, while dust can give you redstone, glowstone dust, and blaze powder. Additionally, pulverizing cobble into gravel sometimes gives a secondary output of sand, and gravel into sand a secondary output of dust. Since sand and dust are both useful (sand for glass and dust for clay), itemducts on the back of the pulverizers take these out, as well as itemducts on the backs of the automatic sieves for all the other items I mentioned before. These get put into a bunch of Better Barrels, which can hold up to 64 stacks of a single item. So there it is! My automated system for metals (and other items). Complicated to set up but now that it’s done, I can just sit back and rake in the items. I’ve already got a fair amount as you can see. I don’t really know what I’m going to do with all this iron but at least I have it! Game lootz! I’d been waiting for the Steam Summer Sale for months so I could get some of the games on my wishlist on sale. And, as it turns out, some games that were not on my wishlist as well…. Nope, having too much fun to stop! XD You might not have time now but at least Minecraft will be around forever and judging by their popularity, so will skyblock mods. So there’s always tomorrow! I really hope Minecraft is around forever. It’s a darn good game.